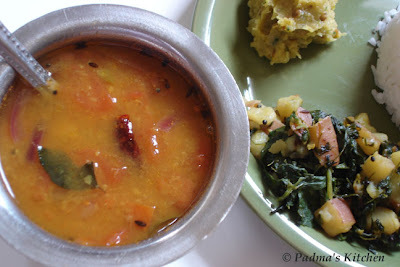 Pappu charu is a daily staple in every Andhrite home, but many are not aware of this incredible *Charu*, or else you can say it is a diluted version of sambhar except that there is no sambhar powder used in this. In the west to be more specific it resembles the taste of a lentil soup but little sour to taste as we use tamarind pulp juice/water. There are many variations to it, you can add many different vegetables to it like okra/bendakaya/bhendi, eggplant/vankaya/ baingan or raddish/mulangi/muli etc etc and are respectively called as bendakaya pappucharu, vankaya pappucharu, mullangi pappucharu. I learned the art of making pappu charu from my Peddama aka mother's elder sister when I went to Vizag on my 12th std vacation. She is a great cook and has magic in her hands in cooking traditional andhra recipes and non-vegetarian recipes. 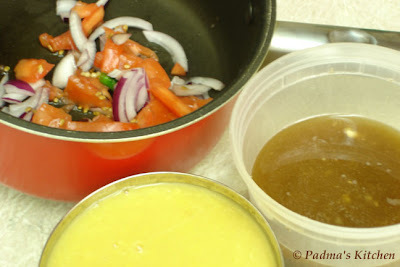 Today I made the simpler version on the request of Bee from Jugalbandi with just tomatoes, onions and green chillies. 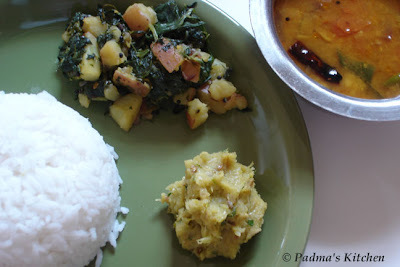 You can find on pappu charu recipe at Vindu's, Mom's Kitchen, Sailu's Food, Mahanandi, and Srivalli's sorry if I miss anyone, these are random listings for the recipe, Enjoy! Wash and soak the dal for about 20 mins or so. Boil it in a pressure cooker for 3-4 whistles. Meanwhile soak medium marble-size tamarind ball in 1 cup of hot water. Once the tamarind is soft, pulp it with hands and filter it. Keep the tamarind water aside and if there is more pulp in the remaining tamarind repeat the same with 1/2 cup water this time and continue so on till you have squeezed all the pulp out of the tamarind just like you do for sambhar preparation. In a deep sauce pan add the red onions, chillies and squeeze in the tomato pieces. To this add the tamarind water, cooked dal, red chilli powder, turmeric powder and salt, mix well and if required add water if the mix is too thick. Bring it to a boil or till the onions are cooked. Lastly temper it with seasoning by heating oil in a kadai/round bottom pan add the mustard, cumin seeds, urad dal/black gram dal then add the torn dried red chillies, curry leaves, and garlic. Once they are golden brown turn off the heat and add asafeotida/hing. 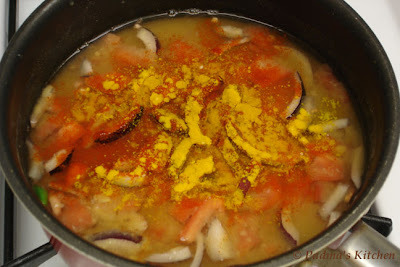 Immediately pour this seasoning into the dal soup, Pappu charu is ready! Here is step by step photo explanation of the procedure, I know which would be confusing with out this. Hey! Glad I stumbled onto your blog, you have some amazing looking recipes here...can't wait to see more! 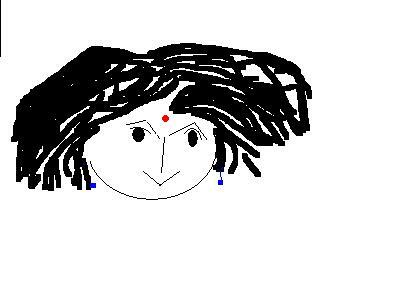 Padma, the pappu chaaru looks heavenly!!! Tadka makes all the difference in the world! thanks for the recipe, padma. this looks like sambar without sambar podi. 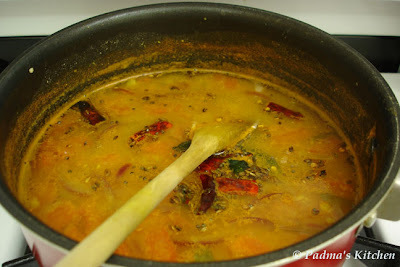 i hate sambar podi, so this is my kind of recipe. That looks tangy-delicious! Padma, I 'invented' my own dhal curry to go with roti canai, a Malaysian panfried bread. I would love to visit India one day soon. Maybe my other half could be based in Mumbai in a few years -- that'd be exciting. 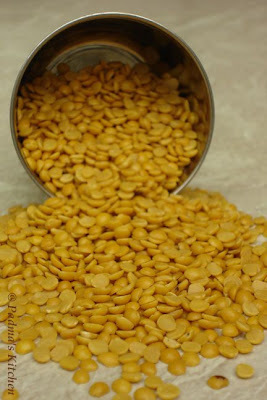 Thanks for a wonderful step by step guide to this delicious dal! 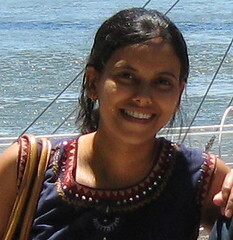 Aruna, thanks for visiting my blog. glad you liked the charu you too have a great blog space dear! Sra, why is this so rarely made? Infact I cannot live without this charu..
Suganya you are very true abt the tadka...no aroma/taste without the tadka..
Bee, I am glad you liked the recipe for charu...well count me in for the sambar hate list! you know I am from Mumbai and will surely envy you moving there, Man I miss Bombay so much! I am sure you will hate first and then love the city after a couple of months! Thanks Nupur, I love your smiling face on my comments page always! Hey Shn tx for your warm comments, I betcha why your DH loved it! Pappu charru too much !!! And thanks for linking me here. Oh that dal is divine. I'm a dal junkie. @ Mythili...even I prefer the same. @ Cynthia, count me in...for dal junkie, coz I cannot eat rice without dal..
hey never heard of onions in pappu charu, thats new. your meals looks delicious. Pedamma pappu charu chala bagha undi! just tried a little telugu! 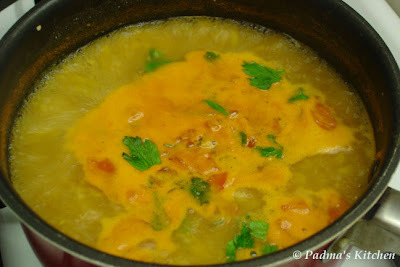 Hi Padma, It is a lovely recipe and different from the regular dal. I will definately try it today. I tried your spagetti and brushetta it was awesome. Thanks for sharing your lovely recipe waiting for new recipe. Athika, how did they came? I am glad you tried and let me know abt the taste too....u rock girl! Thanks Padma Garu, Your recipes are very useful for batchelors like me. This is the most perfect pappu charu recipe ever.i made it right away and am bowled over.it brings back memories of having pappu charu annam at my friends place in hyderabad,,,childhood was made up of so many pappucharu days...i used to lovingly call it papps!! Your blog is great, nice recipes. In Pappu charu recipe, i think we have to add little sugar or jaggery to it! I myself am a skilled cook. So skilled, that until now, people would rather run than eat what I cook (that is, those whose life insurance wouldn't cover death by food poisoning). I tried it out just now. It was so smooth and filling. Enjoyed pappu charu so much. good one.. cooked for the first time... enjoyed it.. Thanks for the recipe :-) I tried it. It was awesome. 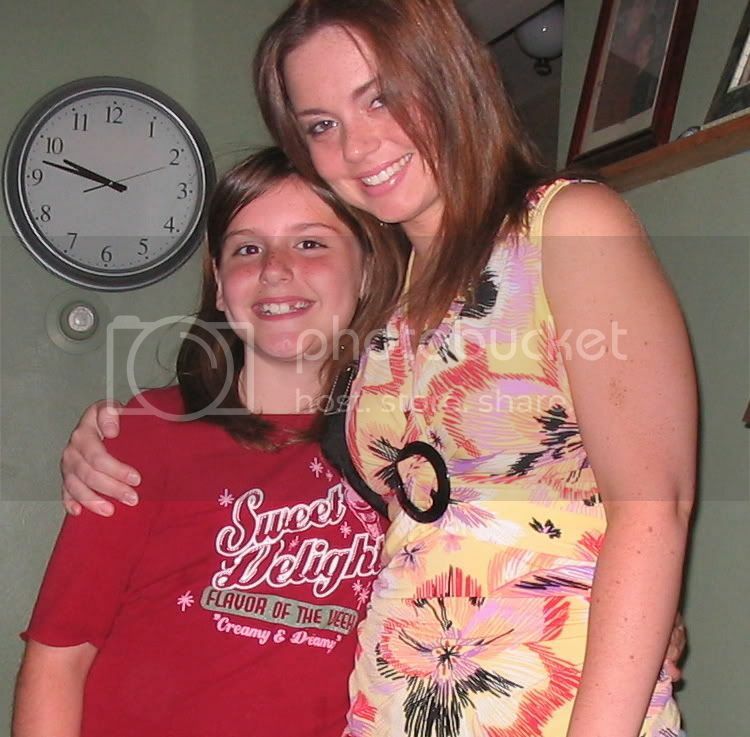 My family liked it very much.